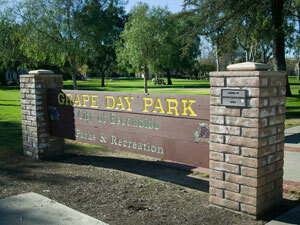 Since the early 1930s, Grape Day Park, Escondido's oldest park, has been the center for community events and activities. Every year from 1908 to 1950, people from as far away as Los Angeles came to celebrate the annual Grape Day Harvest, a major industry in the Escondido valley. The park continues its tradition as the center for community gatherings. It is a registered landmark and home to a turn-of-the-century working barn, Santa Fe Railroad depot, blacksmith shop, and other historic buildings, museums, and monuments. Vinehenge – an interactive public art project located in Grape Day Park. The whimsical project includes a grapevine climbing structure with hidden secrets for children to find, a slide decorated with giant purple grapes with mosaic details, benches in the shape of oversized grape leaves and a perimeter of rocks reminiscent of the rocks in the hills around Escondido. The play sculpture is intended for children of all ages and abilities. It is ADA compliant. The project was designed and fabricated by the artist team, Nancy Moran and Valerie Salatino of Nature Works, Inc., an Escondido based company. For more information regarding programs and hours of operation, please call 760-839-4691.